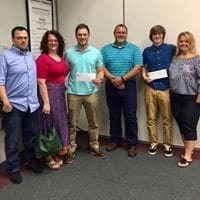 Our 2018 Richard H. Crosser Memorial Scholarship recipients are Luke Kieper and Mitchell Parrish. Watch for the 2019 Richard H. Crosser Memorial Scholarship application in January! The graduating Franklin Central High School student must wish to pursue either a two or four-year degree in structural engineering, architecture, building trades, drafting, business, finance, accounting or some other field related to building trades at a college or university in the State of Indiana. Recipients must have a minimum grade point average of 2.5 (on a 4.0 scale) and be a graduate of Franklin Central High School. First preference will be given to students who have a strong work ethic and display (displayed) a strong commitment to their school and community.